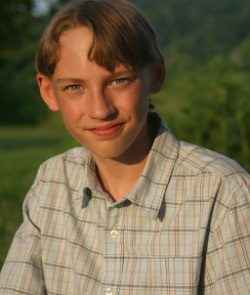 Birke Baehr is an internationally recognised speaker and youth advocate for sustainable local/organic food, regenerative farming and agriculture. To supplement his passion, Birke has visited and volunteered at farms around the United States. He published his first book in 2012, “Birke on The Farm”, which tracks his development from a curious third-grader to a full-blown activist. He has spent the last five years travelling around the United States and Italy visiting organic farms and learning from the farmers who steward those farms. He has attended numerous organic agriculture seminars and workshops; including one with renowned farmer and author, Joel Salatin who Birke looks up to in his pursuit of new thinking about food and agriculture. Birke continues to educate himself in this genre and intends to be a sustainable organic agriculturist in the future. He has a passion for educating others, especially his peers, about the destructiveness of the industrialised food system and the enlightening alternatives of sustainable and organic farming, food and practices. Birke was the youngest presenter at TEDxNext Generation Asheville (Aug. ’10) where his talk became an internet sensation with millions of cumulative views. Birke is passionate about continuing to spread his message for change, as he says in his TEDxtalk, “one kid at a time”. He continues to speak and travel globally, and has been featured on numerous blogs, websites, newsletters and podcast interviews, sharing his knowledge and passion about food. "Birke enjoys getting his hands dirty on chemical free farms, growing his own vegetables, checking out local farmers markets, farms and locally owned restaurants that support local farms. One of the youngest internationally respected advocates of the local food network, he has immersed himself in the sustainability movement and continues to educate the world about food systems."